Photo: William Carey International University (WCIU) has completed the sale of its Pasadena, Calif. campus to EF Education First (EF). 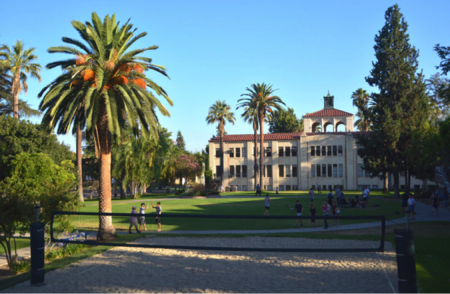 PASADENA, Calif., March 28, 2019 /Christian Newswire/ -- A Southern California university campus that has played a leading role in Christian missionary work around the world has been sold, it was announced today. EF Education First (www.ef.com), the world's largest private international education organization, has completed the purchase of the 15-acre William Carey International University (WCIU) campus in Pasadena, Calif. The campus is also the home to Frontier Ventures (FV), formerly the U.S. Center for World Mission. Dr. Kevin Higgins, WCIU President, said the sale of the Pasadena campus is pivotal to "decentralize" the work of WCIU and its missions arm Frontier Ventures, enabling them to launch smaller-scale hubs worldwide, so they can more effectively focus on key regions in the "Global South," where billions of people have not heard the gospel message. "Frontier Ventures is launching hubs in Chiang Mai, Thailand and other locations closer to 'where the action is,'" said Higgins, who also is director of Frontier Ventures. "This decentralized approach will bring our innovation, mobilization and training expertise nearer to the pioneering organizations working among those who've yet to hear about Jesus Christ." EF plans to renovate and redevelop the campus for its private international boarding school, EF Academy (www.ef.edu/academy), which enrolls international high school students ages 14-19 from 80 different countries. EF Academy's mission is to prepare students for the 21st century through a rigorous global curriculum, multilingual education and community service centric approach to learning. It is expected to open in fall 2020. For more than 40 years, the university and USCWM/Frontier Ventures have equipped cross-cultural workers for overseas Christian service, focusing on "frontier missions" to parts of the world where the Christian gospel is unknown. In recent years, WCIU and its network of partner schools around the world have spearheaded innovations in faith-based international development.